With the help of a star test (or sector-star test) exposure, the size and shape of tube assembly focal spots can be easily determined according to IEC 60336. This method is less complicated than the pinhole or slit camera process and assuming an approximately ideal intensity distribution in the focal spot. it is in many cases fully adequate. 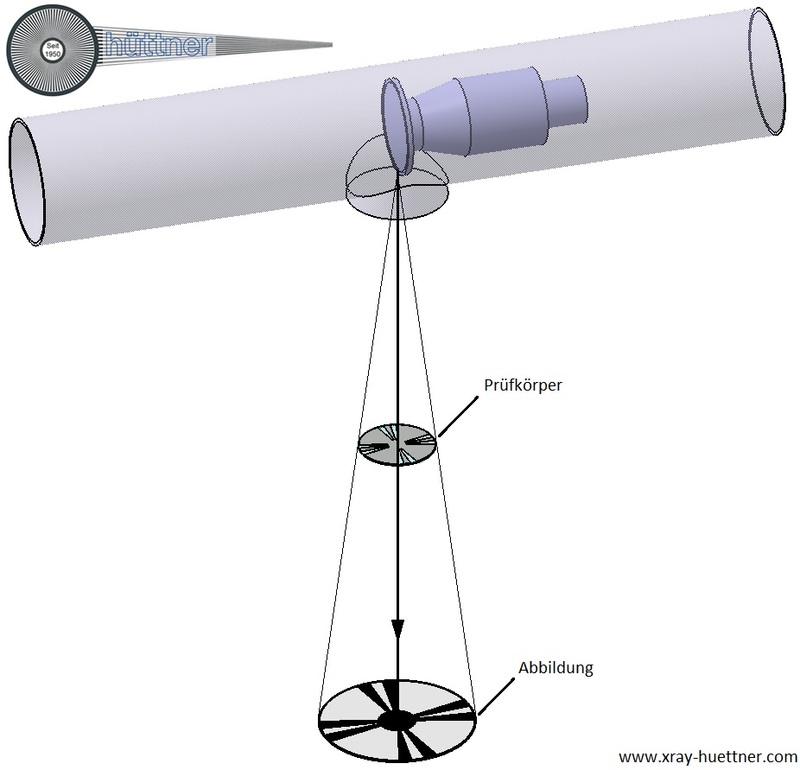 For the determination of the X-ray tube's focal spot size with the help of lead stars, an enlarged image of the star is taken in which the star is arranged at a certain distance to the film. During the evaluation of this image, the procedure is to track the sectors inwardly (coming from the star's edge) until the undissolved margin is reached. The diameter of the marginal figure is represented by d.
Often, you receive further resolved sectors within the marginal figure, whereas concerning the sectors following the marginal figure, those sectors are bright which should actually be dark. This so-called pseudo-sharpness should not be taken into account while determining d, i.e. 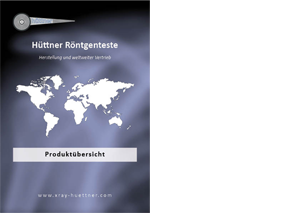 the biggest diameter, which does not show any resolution anymore, has to be used for d.
m = Abbildungsmaßstab (=Sterndurchmesser auf der Aufnahme/ Sterndurchmesser des Testes); als günstig hat sich ein Abbildungsmaßstab m = 1,3 für Brennflecke 0,6 mm und m = 2 für Brennflecken < 0,6 mm erwiesen. Abb. 3b The mean distance of two facing, extremely blurred areas represents the first blurring diameter "Db", although the blurring diameters of two facing star sectors usually differ in their size. 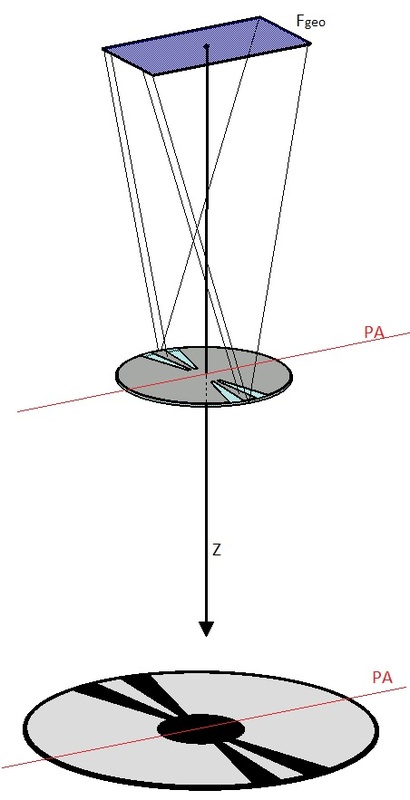 The first blurring diameter which is parallel to the tube axis yields together with the star image diameter "S" the resolution of the focal spot width (!). The blurring diameter vertical to the tube axis yields with "S" the resolution of the focal spot length. The X-ray quanta of the focal spot's latitudes expansion are mainly influenced by the line pairs parallel to the tube axis. This represents a blurring criterion in this direction in the star image (fig.3a). The X-ray quanta of the longitudinal expansion are influenced by the division of the star that is positioned vertically to the tube axis. This yields the blurring criterion in this direction (fig. 3b). In general, the direction of the X-ray quanta paths' convergence parallel or vertical to the tube axis is responsible for the blurring criterion of the respective radiation influencing part of the star. Since the direction of the largest and smallest focal spot expansion is at first unkown, it is best to use stars for the focal spot measurement that are divided over the full angular range of 360°, for example our Type 9 1,0°-360. In the case that there is only one sector star of our Type 9 available, this can be easily managed by taking two exposures in which the star is turned by 45° after the first exposure. S is the diameter of the star image. 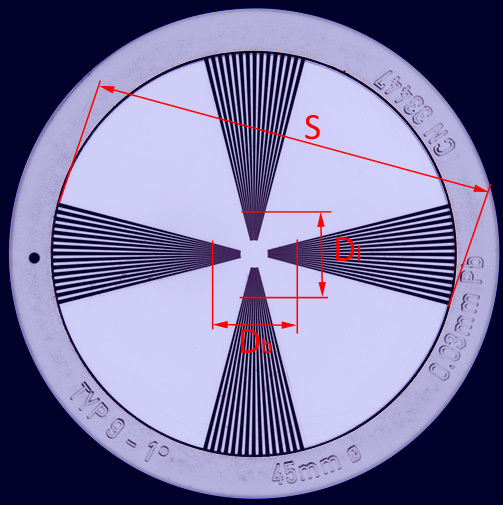 In order to identify the imaging scale m, S will be measured and divided by 45mm (diameter of lead star).